How Can Spiritually Decluttering Your Life Help You Make Room For Love? I recently listened to “The Life-Changing Magic of Tidying Up: The Japanese Art of Decluttering and Organizing” by Marie Kondō. It was interesting as it took a far more spiritual approach to decluttering than other books I had listened to like “Unstuff Your Life! : Kick the Clutter Habit and Completely Organize Your Life for Good” by Andrew J. Mellen which had more focused on making me realize that everything has a place, store “like with like” and that “old hat” given to you by your Grandmother is not your beloved and dearly departed Grandmother (i.e., you don’t need material possessions to remind you to experience emotions and memories). With Marie it felt more like a homage to the souls of objects and that you should only keep those that you use, respect, love and/or appreciate. It reminds me a bit of how they say that if you want to buy a statue of a Ganesh or some other sacred object, you should only buy it if you are prepared to do daily rituals to it (e.g., reciting hymns over it, pouring buttermilk over it, then cleaning and decorating it etc). We should only buy “things” for our house if we are prepared to appreciate them daily or use them regularly or if they are books, if we will actually read them and not let them sit and gather dust. Marie also made it feel that by creating a decluttered and beautiful space, it allows your real self to breathe and to come forth. It allows you to have the space to do things like drinking herbal tea, relaxing, doing yoga and so on. It feels natural to extrapolate this to making yourself ready to focus on giving and receiving love. Because, when objects don’t take precedence in our lives, what does? Connections obviously. This reminds me of a story that Maharishi Mahesh Yogi used to tell about his spiritual teacher Guru Dev. Apparently one time Guru Dev’s master sent word that he was planning to visit the cave where Guru Dev resided. Guru Dev sent back word that there was “no room”. The other spiritual students were shocked by this response, but it was later uncovered that what Guru Dev meant was that his heart was already so full of love for his teacher, that there was no room for any more love. Sometimes it feels like we are all so busy in our modern lives, rushing here and there trying to earn money to buy more possessions and bigger houses and so on, that we don’t leave any room for love in our hearts. Another book that I also listened to was “The Year of Less: How I Stopped Shopping, Gave Away My Belongings, and Discovered Life Is Worth More Than Anything You Can Buy in a Store” by Cait Flanders. Cait’s experiences in getting out of debt, overcoming an addiction to alcohol, decluttering and stopping shopping reinforced the principles that Marie had uncovered for me. Cait described her own personal journey of discovery of who she is and who she isn’t. And as part of that journey she eventually felt closer to her friends and family. She also ended up with greater clarity about her life and had the courage to leave her job and to start her own business. Realizing that she could live on a lot less money helped give her the confidence to do this. Cait also recommends some other books on this topic on her blog. I think we also need to extend decluttering to our digital world as well. Too often we cling to bookmarks, documents and so on that we will never ever look at again. Why waste all that time sorting and storing things you will never look at again? The best advice I received regarding this was from “The 4-Hour Work Week: Escape the 9-5, Live Anywhere and Join the New Rich” by Timothy Ferriss. He said you should never save bookmarks and instead it is best to just research things when you actually need them. This also ensures that you are more up-to-date anyway. Sometimes people think that by scanning their documents, they are decluttering. But really they are just hiding their clutter in the digital world. It is still taking up your mental space and stopping you from living a simple joyous life of connecting to others. Really you are just running away from taking the time to sit with a photo or a document and to decide if it brings you joy or not. Believe me, I know this from a hard lesson I am facing myself as my husband and I scanned lots of things (after the Andrew J. Mellen book) and through a mix-up, I now also have lots of duplicate files to sort through. Don’t let yourself get in this mess – think, feel and discard. I am going to do this now but I think it will take more time to do with files rather than objects and it will cause me to spend more time at my computer which is what I don’t want. I want more time to walk in nature, more time to spend having fun with my husband and more time to form real connections with friends. If you don’t have much money, it can seem strange to be giving lots of clothes, books and other possessions to charities, but I firmly believe that you will make space for abundance to come into your life by giving to others. And, of course, you will only get rid of the things that you don’t really need or really love. A kind friend is selling some of our stuff at her garage sale this weekend. Hallelujah! 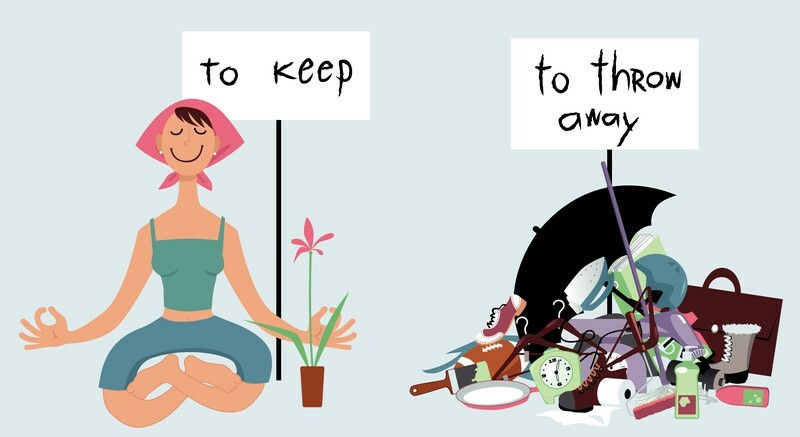 If you haven’t already done so, I encourage you to start decluttering and see how it feels. Aim – as Marie Kondō says – for your own version of “simple perfection” and let the love flow into your life. Previous post: What Is The Vedic Way To Get To Know Someone?